Nixie, a wrist-mounted drone that's designed to fly off to take selfies, has scooped the $500,000 grand prize in Intel's Make it Wearable competition. 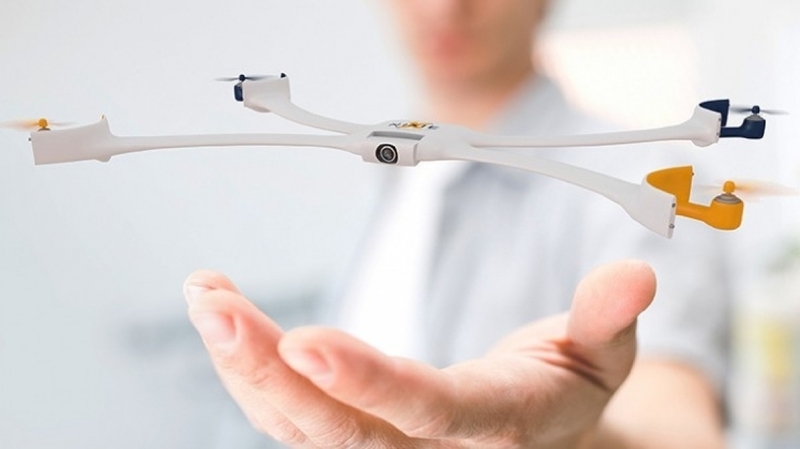 Nixie is designed to take off and snap action shots from above before returning to your wrist. "We all use pictures to capture our moments," said Nixie's Jelena Jovanovic. "We use the tools we have available and we've been doing it as long we've been human." Nixie has two modes: 'boomerang', in which it flies off, takes a pictures and returns and 'follow me', which does exactly as it says on the tin. Nixie isn't going to be on this Christmas' shopping list and is simply a concept at this stage. As part of Intel's Make It Wearable prize, where all finalists received $50,000 funding to create amazing new wearable concepts, it was up against some pretty stiff competition. Check out our guide to the best British entrants, of which Open Bionics were awarded second prize. Open Bionics is hoping to use 3D printing, 3D scanning and open source designs to make custom fitted hands available for under $1,000. The Nixie prototype, as it is now, looks like it could break at a moment's notice, and resembles more a school science project than the next big wearable. However, as it's been dreamed up by Christoph Kohstall, a Stanford University physics researcher, it's sort of the daddy of all school science projects. Intel CEO Brian Krzanich said the competition was an "experiment" but stated it would be held again next year.